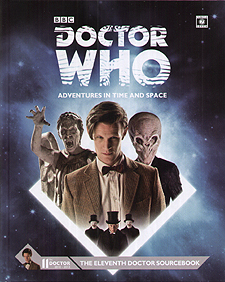 Celebrating the 50th anniversary of Doctor Who, this Sourcebook explores the Eleventh Doctor's adventures on Earth and beyond. With detailed information on all the allies, enemies aliens and gadgets that he encounters, as well as examining each of his adventures, the book contains a wealth of material for the Doctor Who Roleplaying Game, and is also a fact-packed resource for fans of the show! When Amelia Pond was seven-years old, she had an imaginary friend - the raggedy Doctor who crashed into her garden in his blue box. When she grew up, on the night before her wedding, her imaginary friend came back to take her on the adventure of a lifetime. Travel to Venice, into the heart of a crashed spaceship, visit the White House and Area 51 and journey to the centre of the TARDIS. Save the word, get married, meet the TARDIS in human form and team up with past incarnations to save Gallifrey... but what doom awaits on the Fields of Trenzalore?